Sima Kasten as ‘Maddie’, Kaleigh Ronan as ‘Judy’, Colin Budzyna as ‘Brenton’, Ethan Koss-Smith as ‘Sam’, Margaret McFadden as ‘Kelsey’, Jonah Yannis as ‘Ronnie’ and (front/center) Carly Kastel as Ms. Rasmussen in Boston Children’s Theatre’s World Premiere musical THE HOMEWORK MACHINE based on the best selling book by Dan Gutman. Photo by Toby Schine. BOSTON — Sometimes, when you talk to people who have just seen a production of the Boston Children’s Theatre, they remark on the quality of the production, and are surprised how professional both the production and the performers are. While the young actors themselves may not be professionals, the people all around them certainly are. And when you are performing with professionals in a first-class facility such as the Roberts Theatre in the Calderwood Pavilion in the Boston Center for the Arts, you can’t help but be at the top of your game. 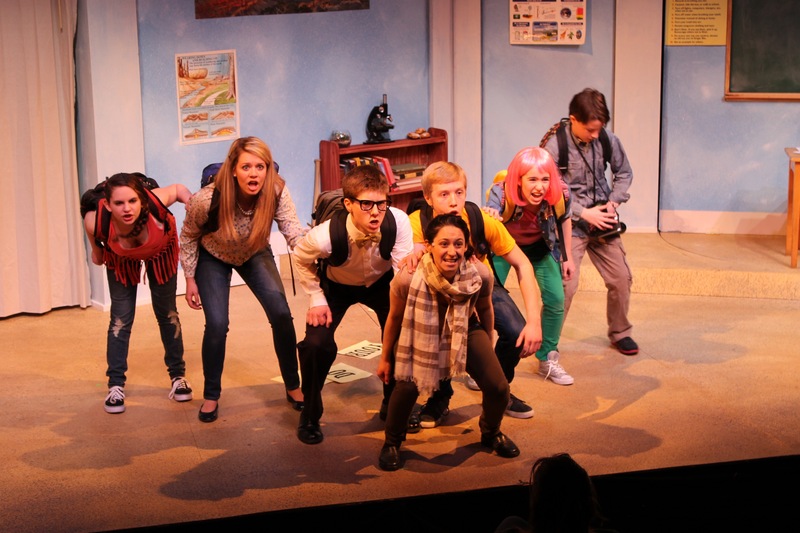 So the BCT’s charming world premiere production of the musical “The Homework Machine,” based on the best-selling book by Dan Gutman, is a fast, funny showcase for some of the BCT’s fine teen-age talents. All four principals shine, led by Colin Budzyna as the buttoned-down, nerdy Brenton, who invents the Homework Machine; Ethan Koss-Smith as the overconfident and overbearing “Snik”; Margaret McFadden as the off-the-beaten-path Kelsey; and Kaleigh Ronan as the smarter-than-smart Judy. Joseph Yannis is a snarky student named Ronnie who threatens to derail the “good thing” Brenton and Co. have going, and Sima Kasten is the voice — or noises — of “Belch,” the nickname for the machine of the title. The adults aren’t given much to do here, although Carly Kastel and Curtis J. Bellafiore are fine. “Belch” does issue some interesting and disgusting noises at times, much to the delight of the audience. There’s no credit listed for the design of “Belch,” although Janie Howland as set designer may have had a hand. Early in a recent performance, the otherwise fine four-piece band threatened to overwhelm the performers, especially when a couple of enthusiastic guitar riffs that obscured the dialogue, but the sound balance returned soon afterwards. Director Mary Guaraldi keeps her young charges en pointe and the production’s easy-to-understand concepts are appropriate for students from the early grade school level on up. The BCT is also presenting performances of John Steinbeck‘s “Of Mice and Men” through next weekend (May 2 and 3). The BCT, under the leadership of Executive Artistic Director Burgess Clark and Executive Director Toby Schine, has been upping the ante for several years now. The theater has produced works such as the sexual-coming-of-age musical “Spring Awakening” and the award-winning “Reflections of a Rock Lobster,” which were aimed at older youths. The gentler, less complicated message of “The Homework Machine,” designed to reach younger audiences, is the ideal way to expose your children to live theater and, hopefully, make theater a lifelong love.